BECK U…. 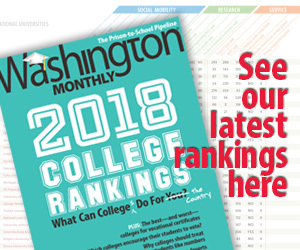 We here at the Washington Monthly take pride in our college guide and rankings, which is why I feel fairly confident that Glenn Beck’s “school” will not be featured in any future issues of the magazine — except maybe as a target of mockery. Have you heard the exciting news? Apparently appalled at the paucity of solid learnin’ in America (excepting, of course, Texas), media maestro and renowned art historian Glenn Beck has announced the opening of his own great patriotic hall of academe. The forthcoming institution o’learnin’, appropriately titled Beck University, will “explore the concepts of Faith, Hope and Charity and show you how they influence America’s past, her present and most importantly her future.” Its faculty features such luminaries as a free-market economist whose degree is in psychology and a Texas Republican Party bigwig who hates, hates, HATES church-state separation. Now, in fairness, I should point out that “Beck University” isn’t a real college. Rather, for a fee, Beck’s minions will be able to access online “courses,” which will be posted to Beck’s site. Regular folks won’t be able to take classes at Beck U, but “Insider Extreme subscribers” — that’s the actual name, not something I made up — can pay $75 a year and get the kind of lessons students will miss if they rely on accredited schools. “This July,” Beck’s site tells readers, “while others are relaxing poolside, head back to the classroom — from the comfort of your own home. That may sound like an oxymoron but Glenn’s new academic program is only available online.” Of course it is. What’s interesting to me about this is not just the silly notion of relying on Beck for an education — though that’s part of it — but also the fact that this self-described rodeo clown is just a remarkable merchandiser. Remember, between May 2009 to August 2010, Glenn Beck will have published four print books, a photo book, and two audio books. That doesn’t include his tours and live shows, nor his paid online site. This from a deranged media personality who reportedly takes in about $18 million a year. Does he really need to exploit his followers so shamelessly?